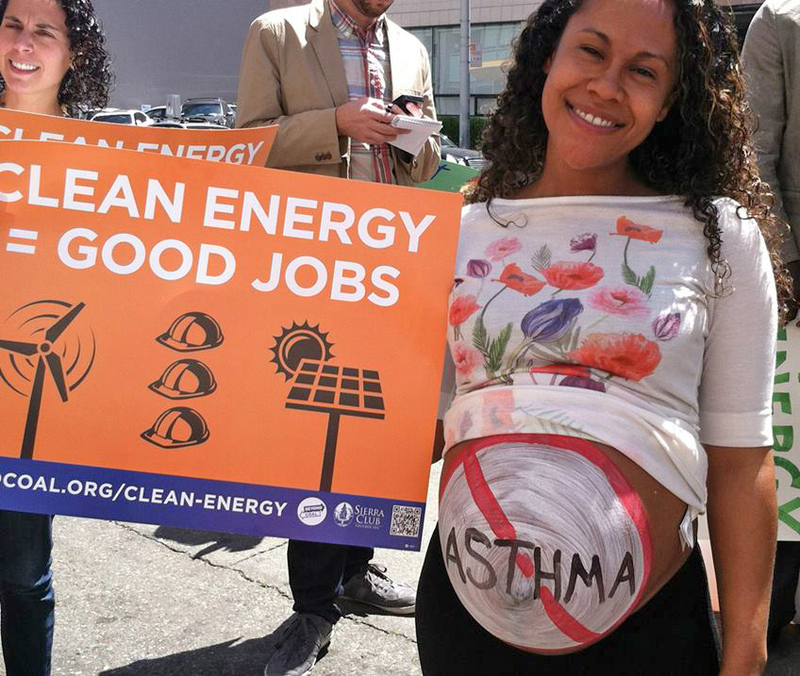 On June 19, a spritied noon-time crowd of over sixty people rallied outside PG&E’s Webster Street payment center in downtown Oakland to protest PG&E's backing of AB 2145, the Monopoly Utility Power Grab of 2014. The bill is meant to prevent the establishment of new community-based energy programs under California's 2002 Community Choice energy law. 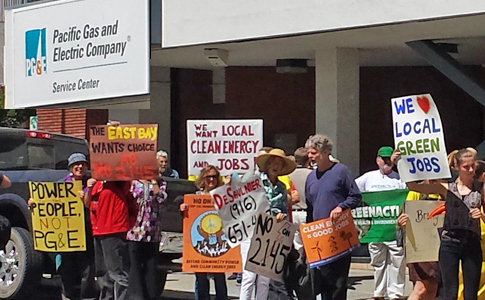 The rally, organized by the Local Clean Energy Alliance and the Sierra Club Bay Chapter, demanded that PG&E stop using ratepayer dollars to undermine the Community Choice energy law, thereby denying communities a greener and lower priced alternative to PG&E electricity. 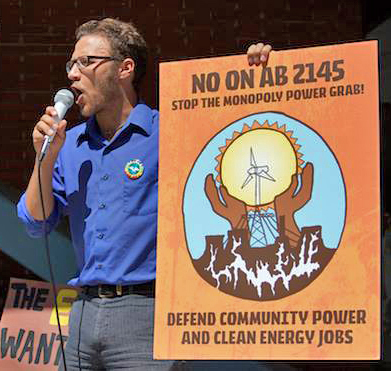 A broad coalition of 170 local government, environmental, social equity, business, and labor groups (see the complete list of Californians for Energy Choice at www.no2145.org) has mobilized opposition to AB 2145, introduced by Steven Bradford, a former utility executive. More than 23,000 Californians have signed online petitions opposing the bill. Still, AB 2145 passed the Assembly in May under intense pressure from corporate lobbyists. Check out this video of the rally! Ironically, during the same week that the Alameda County Board of Supervisors voted to take its first steps toward establishing a Community Choice program, local Assembly representative Rob Bonta voted in favor of the bill that would block his own county’s ability to move forward. 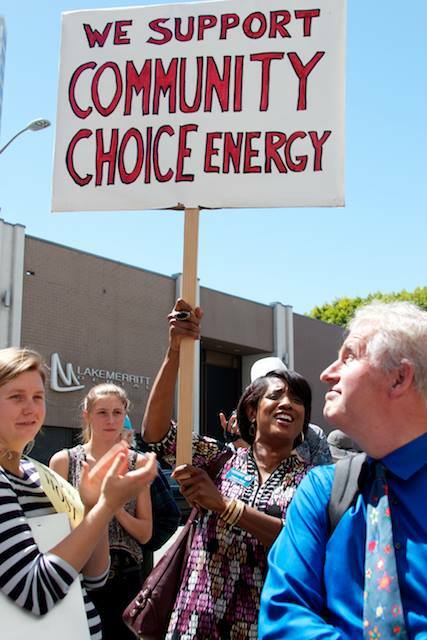 Angered that Bonta did not support the community, the rally called on Senators Ellen Corbett (916-651-4010) and Mark DeSaulnier (916-651-4007) of the East Bay to take leadership on Community Choice, clean energy, and jobs when AB 2145 comes before the Senate Energy Committee on June 23. Communities for a Better Environment, Movement Generation Justice and Ecology Project, 350 Bay Area, Organizing for Action, UC Academic Workers UAW Local 2865, Bay Localize, MoveOn.org, and the Oakland Climate Action Coalition co-sponsored and spoke at the rally, and Greenaction for Health and Environmental Justice and the Ecology Center attended, as well. Berkeley City Council Member Kris Worthington and staff aide to Assembly Member Nancy Skinner, Treva Reed, also spoke at the rally. The event received great presss coverage by the Bay Area News Group, which covers Oakland, San Jose, and the East Bay, and KPFA radio.